Stay22, a travel tech company based in Montreal, announced it raised $750K in its first round of funding. The company has also amassed a growing roster of partnerships – including Pearl Jam, France’s Weezevent and Canada’s Evenko. Along with a growing team and a breakout amount of gross bookings in Q1 2018, totaling $600K, Stay22 is setting the stage for major changes in the event travel industry. The company’s growth is largely thanks to its collaborators – Travelport, its first investor and incubator, lead investor 7 Gate Ventures, and Real Venture. Recent funding is being used to develop its product using predictive booking pattern algorithms and to expand its sales and development teams. Business is progressing well for Stay22. It achieved a conversion rate of up to 4.48%, approximately twice as high as the next leading online travel agency (2.4%). The company is making a name for itself as a provider of convenient, alternative accommodation for event travelers – and organizations in the industry are taking note. Since its founding in 2016, Stay22 has sought to design a solution to streamline the process of accommodation bookings for event travelers. As we know it, this feat requires tens of open browser tabs, including lodging and pricing options, along with multiple maps estimating the distance between hotel and event venue. For organizers, it often means the room block model. The Stay22 map combines all of these features. Stay22’s product is an interactive map created for consumers, ticketers and organizers in the event travel industry. 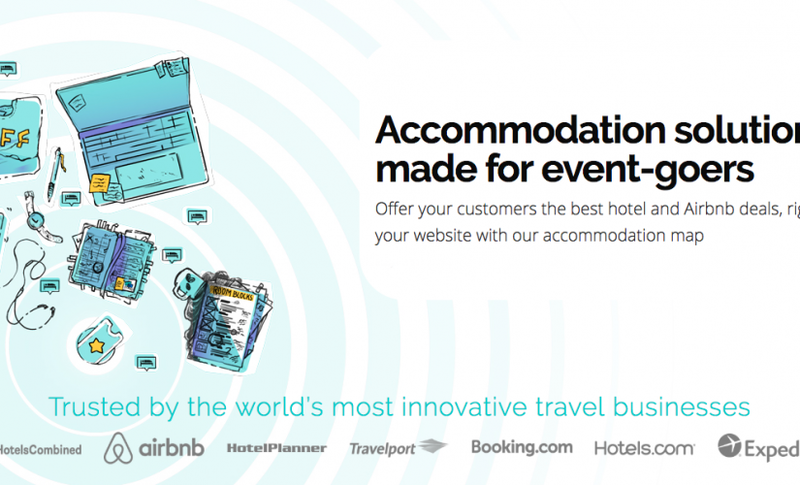 It aggregates listings in over 200 countries from the likes of Expedia, Booking.com, and Airbnb, along with other alternative types of accommodation, into an embeddable widget. Stay22 is quickly becoming an indispensable ally to event planners, allowing them to offload the task of organizing accommodation for event attendees. Meanwhile, planners and ticketing platforms benefit financially from each booking. “The necessity to allow event organizers to focus on putting out the best show to their audience quickly and efficiently is highly important. Stay22 has made a notably valuable product for event organizers that leapfrogs the cumbersome arrangements that came before it,” says Ali Saheli, Partner at 7 Gates Venture and new board member at Stay22. Weezevent, the first self-service ticketing and RFID solution based in France, has also partnered with Stay22. As a service platform, Weezevent’s software boasts over 200,000 events in Europe, with increasing numbers in Canada as well. Stay22 is not alone in its vision for increased convenience in the event travel and accommodation industries. Recently, Airbnb announced the launch of Airbnb for Events, wherein event organizers can embed an interactive map of Airbnbs near their venues into the event website. The two companies have prioritized the needs of a growing segment of the workforce: Millennials, a generation known to be avid event-goers. Technology geared toward creating convenience and a streamlined experience is essential for companies looking to meet the demands of this generation. Airbnb and Stay22 are tapping into a marked difference between Millennials and past generations: the desire for and expectation of individualized travel experiences. Hotel room blocks located just upstairs from a conference venue don’t cut it anymore. With the map-based model, event-goers are able to determine what type of lodging they desire, as well as its location and price range. While Stay22’s listings include hotel rooms, Airbnb for Events does not. The event travel industry is in a period of flux, heralded largely by recent announcements from Marriott International and Hilton Hotels & Resorts. The reduction in commission rates for meeting planners on group bookings at the two hotel giants signals a need for new solutions for concert, conference, meeting, and trade-show event travelers.